I remember when I first saw The Incredibles in 2003. A movie ahead of it’s time, I remember being so “wowed” by all of the animation. The bright colors, the people, and the action was just in-your-face incredible all of the time. Fast forward to Incredibles 2, I actually wasn’t as shocked by the visuals as much as I was then. 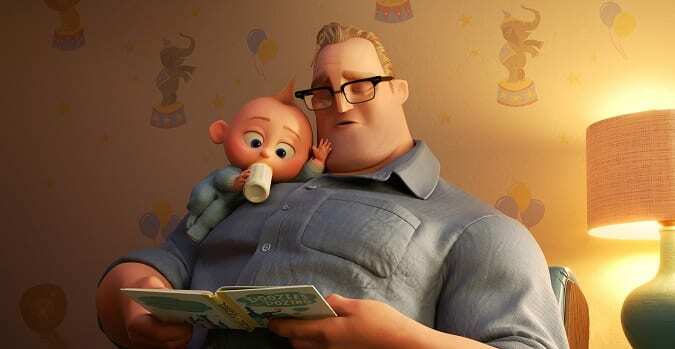 Staying true to the original look while upgrading the old animation technology, Incredibles 2 had quite the task of giving new life to an old concept. And while certainly a face lift was given all around, the smaller more detailed accomplishments of Pixar animation make this animated sequel the visual success, like shiny costumes and better hair. During our interview with Director Brad Bird, he admitted that the boldest thing he could have done for The Incredibles plot line was to pick up where it left off. And so after 14 years the world of The Incredibles hasn’t changed. We are immersed right back into the fight scene with The Underminer. Now with no home (remember when Syndrome’s jet blew it up in The Incredibles? ), the Parr family is in a slump – trying to balance being super with the mundane. Once Elastigirl takes center stage again as the super hero while Mr. 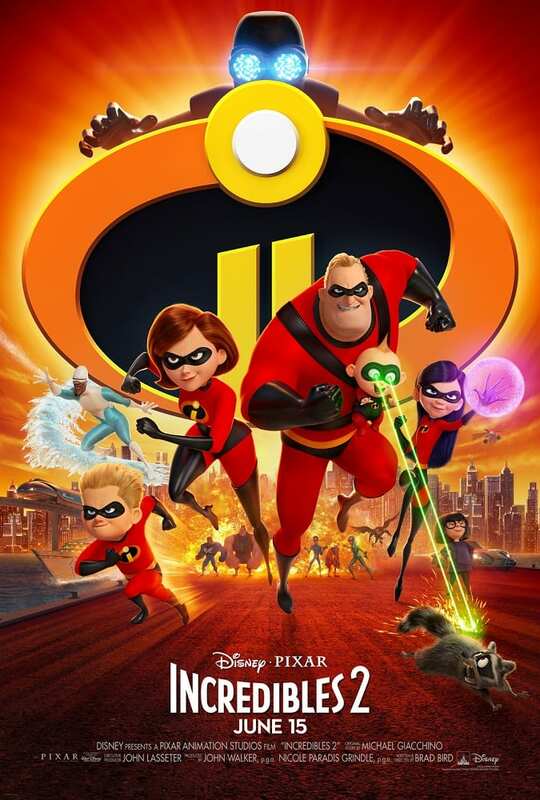 Incredible takes a back seat to be home with the kids (fitting in today’s society), we get a new twist on The Incredibles story as new characters Voyd, Winston Deavor, Evelyn Deavor, The Ambassador and new villain The Screenslaver join the story. Hey, I said no spoilers. But I will say that I figured out the plot line pretty quickly. And the scenes with Whasian Edna (that’s what I’m calling her from now on) were priceless. Incredible super hero movies have to include super hero action. And not too surprisingly, the Incredibles 2 rating is due to action sequences (mild animated violence, explosions, etc.) and a more surprising “brief mild language.” Should you be dashing off to the theaters with your little ones? Let’s break down that PG rating. Swearing. Why did there need to be swearing? After 14 years I guess Brad Bird thought the language flow needed an upgrade too. And while I live in a household that doesn’t use swears, it seems that the rest of the world has adopted words like “I’ll be damned.” Thankfully this was the only instance I found in the film. But honestly, it really didn’t need to be in a Pixar movie. “Oh my G-d,” “What the h-e-double-hockey-sticks” and “crap” was in there too. Violence. 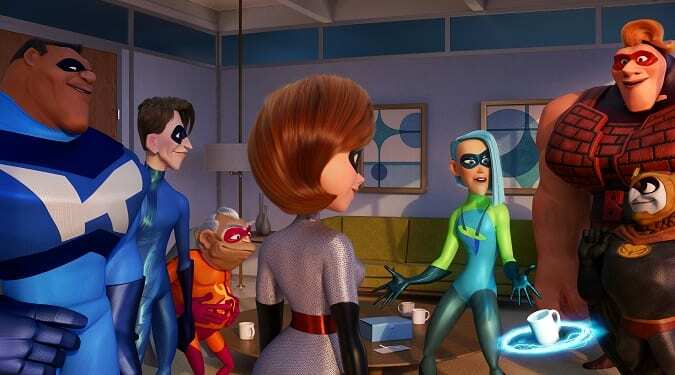 I will say there is a pretty intense scene with Elastigirl and The Screenslaver. Taking my 5-year old to this screening, she quickly jumped into my lap when the scary music, fog and darkness set it. She was still talking about “the scary part” on the way home. Hopefully, no nightmares. 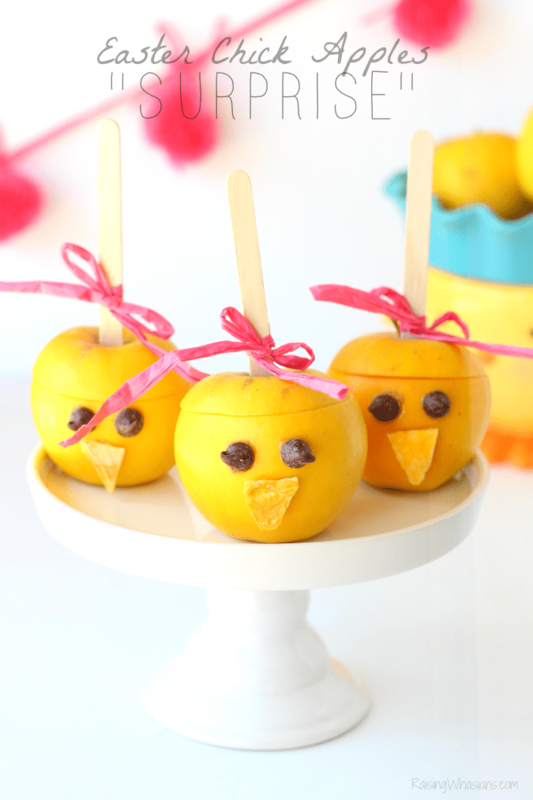 Definitely something to keep in mind for little ones though. Is Incredibles 2 the BEST Pixar Sequel Ever? Toy Story 3 (we don’t need to talk about Toy Story 2), Cars 3 (see previous parentheses) Monsters University, Finding Dory. When it comes to Pixar, they know how to do sequels – and pretty darn well. There already is lots of buzz about Incredibles 2 being the potential “best” Pixar sequel ever. Am I convinced? Nah, not yet. While certainly there is much to applaud after a 14 year hiatus, I think the original is still the best. More lines, more priceless moments, more “wow,” I found that Incredibles 2 while amazing was still missing some of that punch. Most of the best lines were in the trailers. But the action scenes were definitely impressive. Mr. Incredible at home with the kids was flipping hilarious. And Jack-Jack definitely steals the show. I will say that Huck Milner, who does the voice of Dash was SPOT on. And I loved that the team was not afraid to hit you in the face with the opening scene with Johnathan Banks, the new voice of Rick Dicker. So, after 14 years, I loved the sequel. It was…incredible. Sure. We liked it. But there’s something to be said that after 14 years, what has happened to our kids’ movies? Why did Disney Pixar feel the need to conform their animated movies to today’s society? What’s wrong with a kid movie that preserves their innocence, in a world where bad language and violence aren’t necessary to drive a positive message home? In that regard, I found Incredibles 2 disappointing. I hold Disney movies to a higher standard, as a safe place for my kids to watch, learn and make memories. Are we as parents ok with glossing over dark themes and crude language because “everyone else is doing it?” I hope this isn’t the future of Disney movies, because otherwise I’m going to have to prescreen movies a lot more. C’mon, Disney. We can do better here for our future generations. Hopefully this Incredibles 2 movie review will help put your parent minds at ease as we sit back and watch this 14-year sequel in the making come to life. I’m not convinced just yet that this is the best Pixar sequel ever. But we could always wait for another 14-year sequel…they certainly left it open. Incredibles 3, anyone? 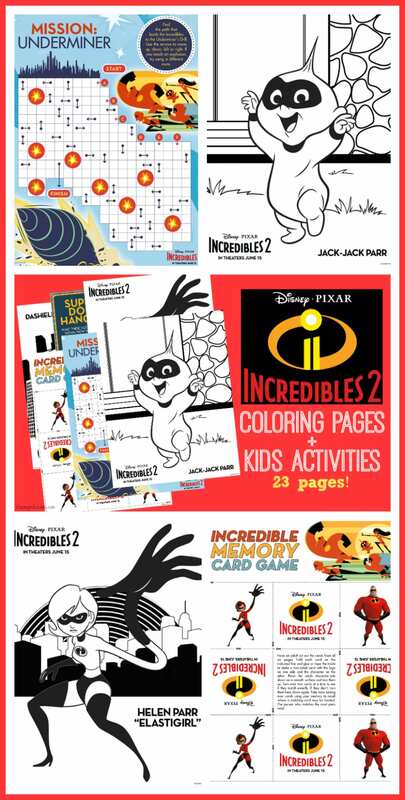 Incredibles 2 hits theaters June 15, 2018. I’m curious to see if you’ll find this Incredibles sequel was worth the 14-year wait. Do you think Incredibles 2 is the best Pixar sequel ever? Oh my God and crap aren’t bad words. I think this is an individual and personal choice on what is considered bad language. Just because you do not find it offensive doesn’t mean that everyone thinks this way. I put any possible wording in there so people who do find them offensive can see. I also think it overall strange and saddening to see that any questionable language be in an animated Disney film. I completely agree. I was shocked and disappointed to hear of the profanity in this movie. Pixar has been a studio producing family friendly content appropriate for all ages for 23 years. So why the bad language, why now? Just sad to see that questionable language is starting to creep in to Disney animated films. This movie’s menacing, voice-altered, darkly mitivated, futuristic-looking villain who wielded a taser rod in a square room with flashing hypnotic trance patterns projected everywhere, gave my 9 yet old and 6yr old nightmares. After the movie, my 9 yr old was running up the stairs to grab his pjs so fast that he tripped and fell because, he said, he was too scared to be by himself after the movie. I am shocked that so many people loved this movie and found the villain to be “lackluster”. The character was not well developed but still insanely creepy. To kids, the villain looked like a psychopath who transmitted his/her thoughts through other people by using the television and technology to turn the Incredibles kids’ parents and all of the other “safe” adults in their lives into mindless, crazed aggressors like something out of the Purge. This movie was not ok for kids in my opinion. I will be prescreening movies and waiting until long after opening night to even see another Pixar movie with my kids. So sad. Our society is overexposed to violence, leaving most of us unphased by overly dark themes and aggression in even children’s movies. I hate to see kids and family entertainment take a turn for the worse. Can’t we leave our kids just a little bit of innocence? I partially blame society’s idea of what Kids/Family entertainment is. Today, we package PG-13 movies as family entertainment. Disney isn’t helping with this. They treat their Marvel franchise as family entertainment by advertising on Disney Channel, marketing toys in Disney Store, and brining Marvel attractions to their theme parks. In my opinion, however, Marvel movies are far from being appropriate for kids or families. They’re profanity laden, have tons of sexual innuendo, and quite a bit of violence and killing. It surprises me to see how many kids jmd toddlers are seeing these movies in the theater. I’ve always felt the need to protect young kids from content like this, but maybe that’s just me. I, too, worry about the future of kids’ entertainment and wish someone would pull back a bit on the inappropriate content. To piggyback off of what was previously discussed, I didn’t consider how scary the villain would be to young children. Aside from the creepiness, I think the villian is symbolic of how spending too much screen time turns us into mindcontrolled “zombies”. Whether or not we like to admit it, media and tv alter our behavior and have the potential to do much worse. This movie does a good job of representing that. I’m not sure if children will understand that to be the message, but I appreciate Disney/Pixar attempting to share that message. I dont like the word stupid either. I think as a parent it is offensive because a lot of times they way kids use it makes it profanity. You are absolutely right! I dont want my son saying those words it is a personal choice but I dont like hearing even adults saying them. Thank you for warning me. My son is only 3 and we were looking forward to watching this. Now I will have to watch before he does to censor. Usually I can rest assure knowing they have made a clean film. My goodness, I don’t will go see this movie now.. You can Call me an old fashion grandma. I was very disappointed in the film and I think this is just one of many that will be released with a rating of PG with offensive language and such. It’s so sad. Personally, I didn’t expect anything milder from Incredibles 2 violence-wise. The first one was also on the same level and the interviews with Brad Bird shows that he does like a lot of violence (although not gore). I think it became scary with the flashing lights and creepy mask. My daughter is seven and was not afraid but she is also just a fan of action and the such so I understand how a child who likes milder movies may be afraid. The cursing makes me think that Pixar wasn’t expecting a turnout of a such a young audience given that the children who originally saw it when it first came out are adults now. 4 year old twin girls: Nightmares about memory being erased and the scene where the villain kidnaps Elastigirl. 5 year old nephew: Nightmares about kidnapping scene and backwards train 🚂. 8yo son: Upset about Screenslaver for a while but no nightmares. He won’t play on the iPad or watch TV though. 13yo niece: Loved it, no major reactions. Would bring my mom, the memories from the first!!! I would being my family! We don regular weekly family movie nights! We all enjoy it! It is never a dull moment in my house with a 15 yr old, 12 yr old, 10 yr old, and a 5 yr old! I love it! This comment section is hilarious. Just enjoy the movie. Snowflakes raising snowflakes. It was great for my twin 6 year olds. They seem to not catch the cursing parts or know better than to repeat them. They liked running around like Dash afterwards and they both thought the baby has hilarious. My kids–after I see it alone. It sounds so cool. I have not seen this yet but definitely want to. Nobody else is going to police what you allow your children to view. You have to be vigilant about what you believe in. Disney, Pixar, all of them only make money if their movies are bought/attended. If they hear from enough people that they’re going too far, they’ll either reign it in or lose money for refusing to do so. I would bring my daughter and my lil nephew!